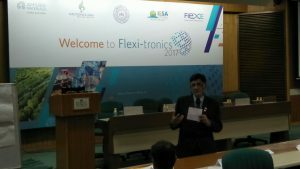 Speaking at the Flexitronics 2017, a well –attended academia-industry conclave on Flexible Electronics here in the national capital, Additional Secretary of the Ministry of Electronics and Information Technology (Meity), Mr Ajay Kumar said the flexible electronics is a new age technology and India should look at maximizing innovation in the emerging technology to lead – not follow- the curve. Flexible Electronics is an entirely new design tool with flexible displays that fold out as large as a television or a tiny smartphones, that can be wrapped around wrists or photovoltaic cells and reconfigurable antennas that conform to the roofs and trunks of our cars. It can also be flexible implants that could monitor, treat cancer and help paraplegics walk. Flexitronics 2017 was organized by nano-technology leader- Applied Materials, and IIT-Kanpur on July 21st in New Delhi. India Electronics and Semiconductor Association was the industry association partner to the event. The learning were built on thru the day with speakers like Dr Jitender Sharma, AP Medtech and BK Karna, Packaging Clinic and Research Institute, presenting the perspectives on smart healthcare and smart packaging. Two breakout sessions planned post lunch gave food for thought on challenges and enablers for the sector. Dr Vinay from Pathshodh, a SID Indian Institute of Science incubated startup, explored an opportunity for making the strip testers for their project on flexE substrate at IIT Kanpur. Packaging managers from consumer companies like Himalaya and ITC contributed their thoughts for enabling smart packaging opportunities by tying applications like anti-counterfeiting, inventory management and user support thru appropriate technology interventions.